BUG FIX: Fixed crash for when Tag Manager had multiple sorting layers with the same name. BUG FIX: Added a hack fix for Unity's CompositeCollider2D class which is currently not being updated properly. 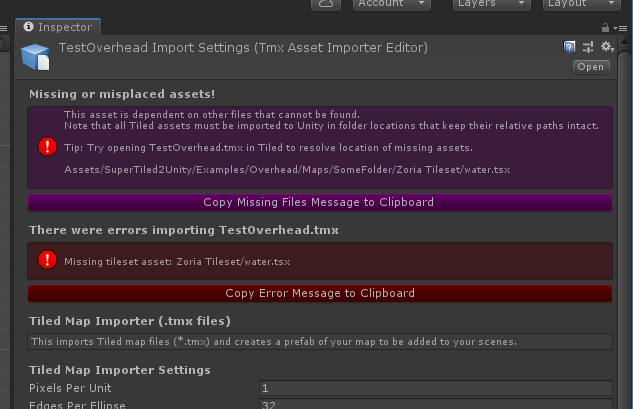 IMPROVEMENT: Better error reporting for when a Tiled asset is missing. By far, the most commonly reported issue using SuperTiled2Unity is due to the way Tiled map and tileset files have dependencies on other files. A Tiled map file (TMX extension) may reference Tiled tileset files (TSX extension) or any number of texture files. These files need to retain their relative paths to each other when they are imported into Unity. I'm hoping the improved reporting with the inspector will make this more obvious when it happens. Does this work with the new Unity Tile Map? Hi there, filharvey. Use, this imports a Tiled map file into a prefab containing Tilemap components.